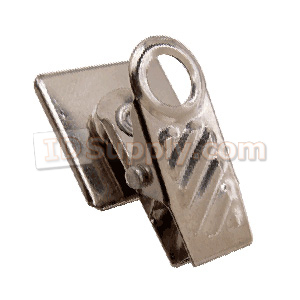 SAB-Clip Adhesive Back Clip. This adhesive backed ID badge clip creates a strong adhesive hold and can be placed on the back of your ID cards. Once the adhesive strap clip is adhered to the back of your ID card you can use it to clip onto other materials. This allows you to have the functionality of a strap clip without having to punch a hole or slot into your ID card. Plate size is 1 3/4" X 1/2".